Organic flaky sea salt with garlic, chilli, herbs and spices. 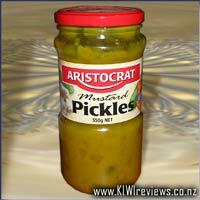 Perfect to rub into or liberally coat beef or pork to barbeque, grill or roast. Can be used to make a salad drizzle or a delicious marinade. I could sit and smell this bag of fusion salts all day it smells so good. 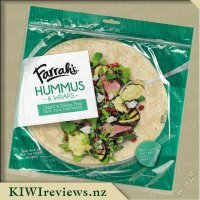 I love the see through bag and resealable pouch which makes it easier to open and close and keep fresh. I was surprised at the aromas that come from the bag as soon as you open it. I could not wait to try this product and was thinking how I would use it. 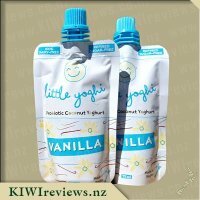 I however noticed with the labeling that the nutritional facts were not stated which annoyed me and I tried to find it on their website but no information was on there only he ingredients. I used this with venison as we eat a lot of venison steaks and we were having a bbq with friends so what better way to get reviews. Every one really loved it and commented about how the flavours worked so well together and were strong in taste and loved the chili flakes with the hit of hotness. It was a great success and people asked how much it was so I got online and looked it up. Some were a little hesitant about the price and others said it was reasonable. I decided to use with chicken drumsticks which are quick and easy to make so I rubbed some on and roasted them off. I loved the smell that came from my open and these were finger licking good. Easy as and so much flavour to it. 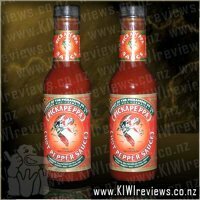 This is a great product and could be used for so many dishes and other ways and you get lots of portions out of it. 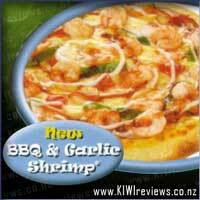 The flavours are just amazing and it makes a boring meal so much enjoyable. 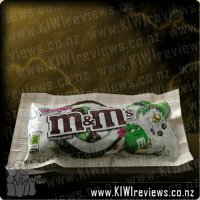 I think they are onto to a winning product here however I think they need to start the nutritional information on the pack as that is really important. I can&apos;t wait to try other flavours. 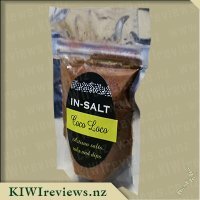 I love a good seasoning, in fact I have a cupboard full of good and bad ones because I do try a lot, most of them are in a shakers or mills but this In-Salt infusion of organic salt, garlic, chilli and other spices came in a resealable bag. I like that you can see what you get with the front of the bag being see through, but it did make me see that the infusion was clumped together badly, however that was easily fixed by rolling the pouch under my hand on the counter for a bit. After studying the rear of the package, I was surprised to see that there was no nutrition info or net weight at all of the contents, which is mandatory when selling a product, but I guess the product is new and being developed so this must still be in the pipeline. I opened the pouch and took a good sniff and the first fragrance I recognised was cinnamon then fennel which immediately gave me a few ideas, so I decided to use that evening as seasoning on my baked potatoes and rubbed onto the skin of my baked chicken legs. 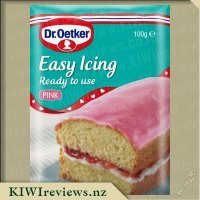 It was relatively easy to use, but in all honestly I would have preferred a shaker or mill to apply even coverage as the bag was prone to either pouring out too much or little. The finished meal was very yummy and my family all commented on the new taste of their potatoes and chicken but with no complaints, with them all agreeing we should have it again. I checked out In-Salt&apos;s website for further recipes for ideas and I see they have a pork belly recipe on there.....mmmmm that&apos;s next! 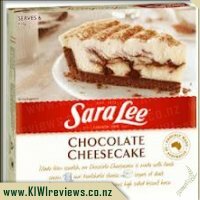 One thing I really love KIWIreviews for is the new food related products I get to try, especially those that I can use to create yummy lunches and dinners (I am definitely a savoury person!). 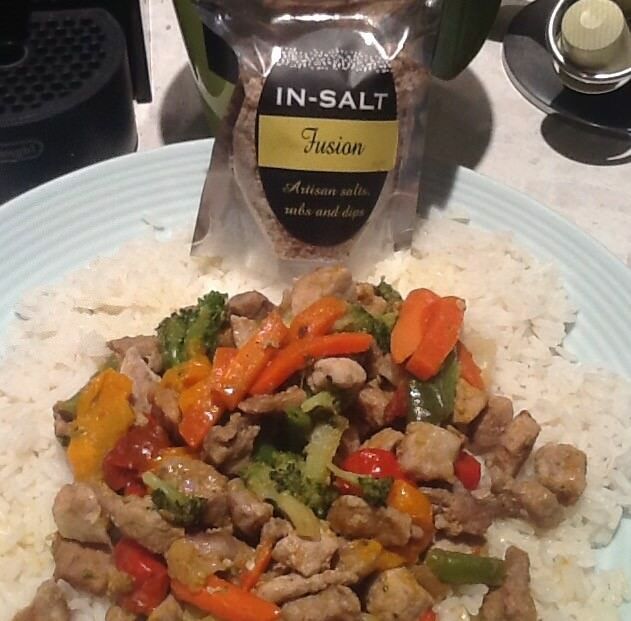 I was pleased to receive a bag of the In-Salt Fusion in my latest review parcel. Heading to my partners house for dinner (he is a far better cook than me and loves to help me experiment with new products too!) 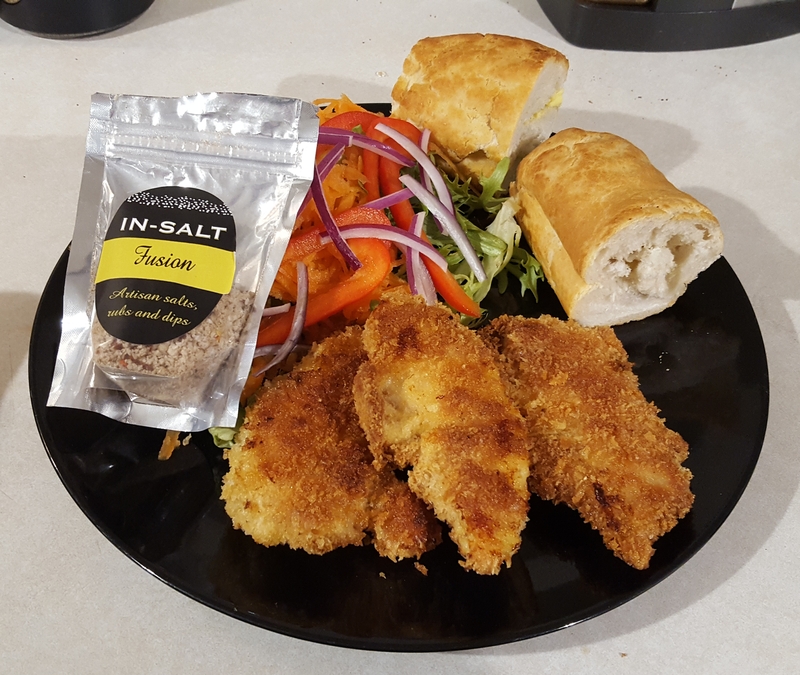 we decided to try is at part of a coating for some chicken tenders alongside a simple salad and fresh bread. He coated the chicken tenders with some flour that had some of the fusion salt in it, dipped them in egg and then coated them with panko breadcrumbs that had some more of the fusion salt in it. He pan fried them to get them golden before baking them in the oven to make sure they were fully cooked through. While waiting for them to bake I decided to open up the packet and have a little smell. The star anise came across as strongest first, although my partner did say the fennel is probably part of what I&apos;m smelling too. I haven&apos;t smelt fennel on its own to know what it smells like however looking at google it is similar to anise. Upon smelling again I could pick up some of the cinnamon too. You can see chilli in it so I was expecting it to have a little bit of heat. Taking the chicken out the most amazing smell wafted from the oven. We dished up the chicken and sat down to enjoy. Usually I am a leave the meat until last kinda person, but I had to have a mouthful! The taste was subtle (could possibly do with a little more of the fusion salt in the mix) but it was very very yummy. It was a very asian type flavour, with some mouthfuls having a bit of a spicy hit with the flakes of chilli in the mix. It is something I would definitely do again, and am looking forward to my left overs for lunch tomorrow! A good seasoning can really add a whole new dimension to the food we eat. 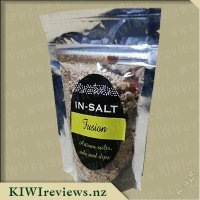 When I saw that In-Salt had Fusion salt available for review through KIWIreviews I was rather interested. The ingredients list was what drew me to the product. My mum used to cook a Vietnamese dish using star anise. We also used to grow fennel in our garden. These are childhood memories which will always stay with me. I had a piece of salmon in the fridge which seemed to call out to me to trial the salt on it. I sprinkled the salt on it prior to cooking and rubbed it in a bit. We found that the salt mix added a nice couch to the top of the salmon. In the same meal, I shook some over the potatoes and added some to the homemade mayo. After doing this, I found that the kids didn&apos;t like it very much. As a workmate used to say, how sad, too bad! My husband and I enjoyed it and we weren&apos;t apologising that it turned out to be a more adult tasting meal than one aimed at the family. We found that we had to put in a lot of the salt mix in order to make the mayo have a strong enough taste. 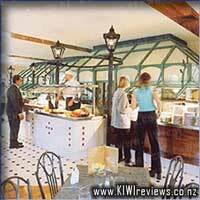 It was really nice on the salmon and potatoes and worth repeating (perhaps just on the adult portion of the meal). I also made a homemade Turkish bread using a recipe from "Lazy Cat Kitchen" - www.lazycatkitchen.com/no-knead-turkish-bread/ Instead of using the sesame seeds in the recipe, I topped the bread with Fusion (and I also replaced the salt in the bread with Fusion). 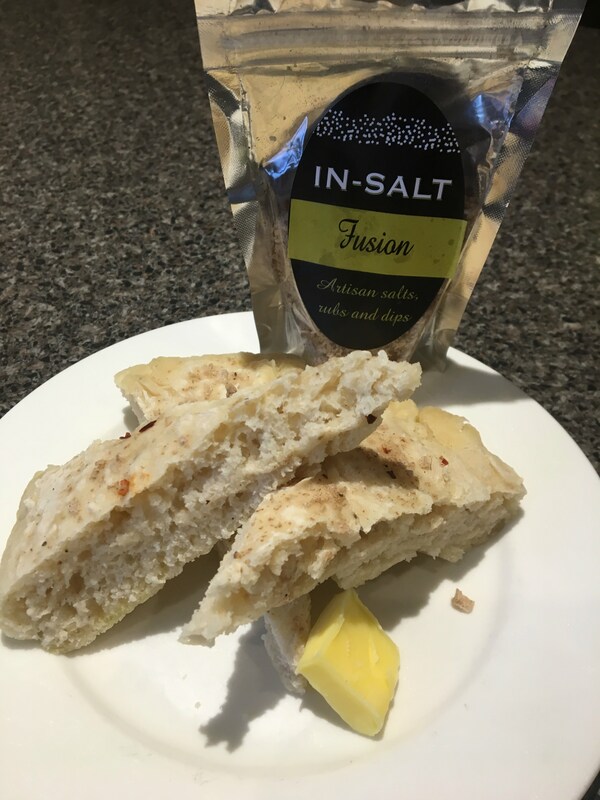 Both my husband and I really enjoyed this bread - it was easy to make and the Fusion salt mix really enhanced the bread. 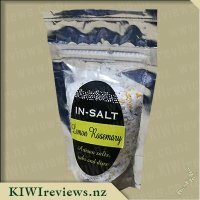 The salt mix has a very different combination of flavours to anything I have tried previously. I tried a bit on my finger and put it straight into my mouth. 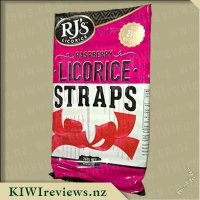 I found that the flavours bounced around my mouth. Initially I could taste salt and then the other flavours kicked in one by one - chilli, garlic, cinnamon, cloves etc. 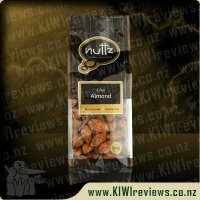 I love the fact that this product is made in New Zealand and from locally sourced ingredients. I enjoy the opportunity to support the people in our own country and the products that we create. 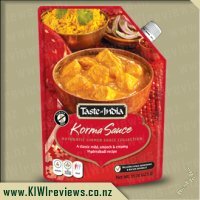 We have added this mix to a variety of dishes over the last couple of weeks and have enjoyed the new flavour to our food. She and her partner are quite definite about what they like to eat, and tend to be fairly traditional in their tastes, so I was not going to do my usual experimenting - I would stick to a plain pork stir-fry with vegetables and Basmati rice. I marinated the pork overnight in a little soy sauce and three teaspoons of the in-salt; by morning it smelt heavenly and she was really looking forward to trying it! I cooked the pork before adding the vegetables as I wanted them to remain crisp. Both of us tried a small taste once the meat was cooked through; I could tell by her face that she really liked it. I asked if she thought it was strong enough, and she agreed that it was. Just before serving it, I scattered some Proper crisps over the top to give it some crunch. After my success with the stir-fry, I decided to try something a little more adventurous. Now that I was back home I could afford to be daring! I tried it scattered on top of pumpkin soup just before serving it, and added it to garlic bread before I heated it through. Both of these dishes were greatly improved, and I think I will continue to use it this way. I also put it on the table when we had steaks and was interested to see that everyone used it instead of table salt, putting it straight on to the meat. It seemed there were no end of possibilities. The last thing I have tried it with so far is with mashed potatoes. After cooking them, I spread them on top of some mince to make a cottage pie and put it in the oven to brown. The addition of a spoonful of Fusion made the potato far more appetising, and the meal was transformed into something special. There is only one problem. I am using up my packet at such an alarming rate that I will soon have to go and buy another one! When I got this, my initial thought was that it didn&apos;t look too exciting or interesting, then reading the list of ingredients, I was a bit worried that there was too much going on and that I wouldn&apos;t really be able to taste anything or it would be a fight for my tastebuds and therefore be plain and boring, there&apos;s eight different ingredients in this tiny packet. Opening it up I gave it a few tentative sniffs in which I could pick up the fennel, cloves and star anise, giving it a taste test I got a huge hit of salt which overpowered almost everything except for the three ingredients I could pick out by smell. I couldn&apos;t work out what to do with this first and so its first use was on a whim. I had made some soup and wanted the base to be vegetarian so I cooked the meat seperatly. I had some shredded turkey which I saut� ©ed in a little oil before adding a small amount of In-Salt Fusion, mixing it up and letting it simmer for a few minutes until the meat was hot through. The soup was then dished up and the meat added to all but one bowl. I had my family of four plus four more for dinner, all except for one enjoyed their meal and four of us had seconds. Fusion added a nice touch of heat and some yummy flavours, I was relieved that the salt didn&apos;t overpower everything else. 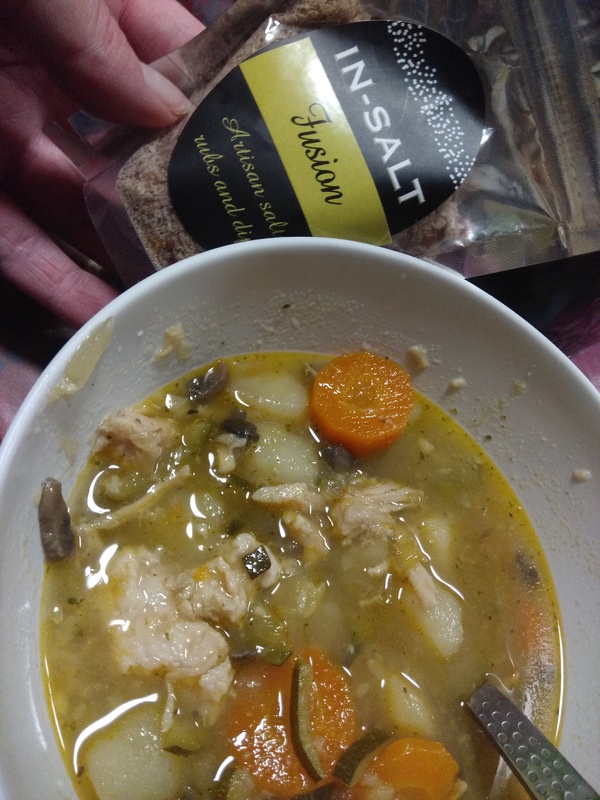 I decided to use this in place of my usual soup, for a few meals, finding that it added some nice hints of flavours, I just found that I didn&apos;t need to use much as all to get the full flavour without that strong heat. I find myself still with half a packet left and it&apos;s already proven itself to be versatile, if it goes well with all the other meals I use it in, I can certainly see buying it again and I know a friend or two who&apos;ll enjoy it. Coconut and Milk Chocolate in a crisp candy shell. Melts in your mouth, not your hand.